Rafael Devers hit a three run home run in the sixth inning. 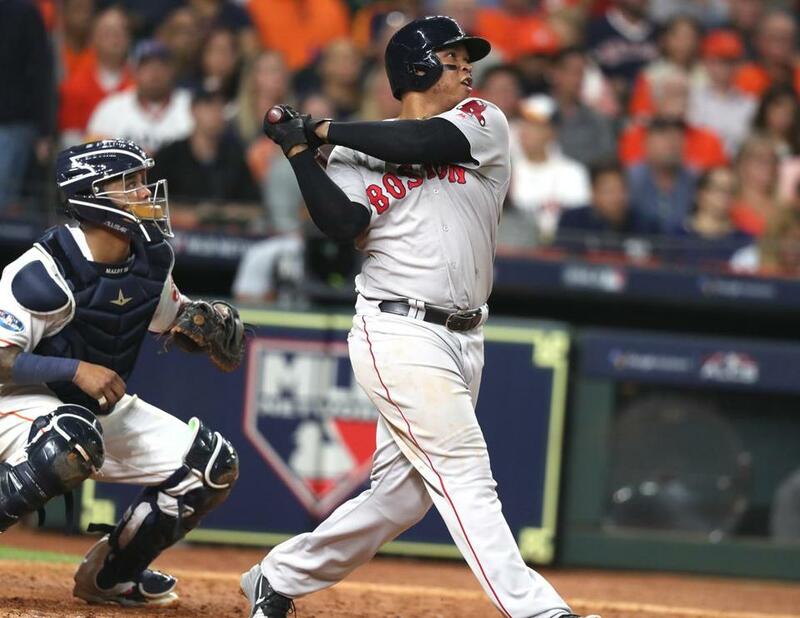 Rafael Devers hit a three-run home run in the sixth inning of Game 5 of the American League Championship Series Thursday to lift the Red Sox past the Astros and into the World Series. David Price pitched six innings for his first postseason victory. The Red Sox won the series, 4-1. The Red Sox will face the winner of the NLCS between the Dodgers and Brewers when the World Series begins on Tuesday in Boston. Game 6 of the NLCS is Friday in Milwaukee. Here’s an inning-by-inning review of the way the game unfolded. Bottom: Craig Kimbrel replaced Nathan Eovaldi on the mound. After Carlos Correa struck out swinging, Kimbrel walked Yuli Gurriel on four pitches. Marwin Gonzalez struck out looking, and Tony Kemp flied out to center to end the inning. The Red Sox punched their ticket to the World Series. Top: Roberto Osuna retired the side in order. Bottom: George Springer’s two-out base hit into center field put a runner on first, but Jose Altuve flied out to end the inning. Top: Mitch Moreland struck out swinging to open the inning. Ian Kinsler ripped a shot to left field and beat the tag at second for a double. He advanced to third after Roberto Osuna threw a ball in the dirt that bounced off catcher Brian McCann’s chest protector, but was left stranded. Bottom: Matt Barnes replaced David Price on the mound. With two outs, Marwin Gonzalez hit a solo shot to put the Astros on the board. Barnes then walked Tony Kemp to put a runner on first. Game 3 starter Nathan Eovaldi replaced Barnes on the mound, and Josh Reddick flied out to end the inning. Matt Barnes replaced David Price on the mound for the Red Sox. After retiring the first two batters he faced, Marwin Gonzalez hit a solo home run to cut the Red Sox’ lead to 4-1. Top: Roberto Osuna replaced Justin Verlander on the mound and retired the side. Top: Mitch Moreland led off the inning with a double. Leftfielder Tony Kemp made a play on the ball at the wall, but did not catch it. 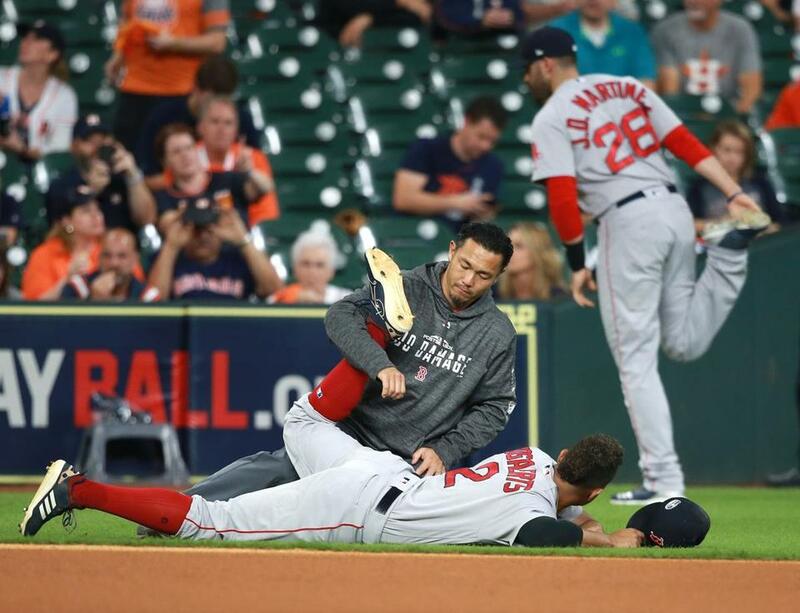 Ian Kinsler hit a right-field single that advanced Moreland to third, and Rafael Devers drove both runners home with a three-run blast to center field. Verlander retired the next three batters to end the inning. Bottom: David Price retired the side in order. Huge out for Price on the 1-3 swinging bunt by Marisnick. Huge out to get through the fifth. Interesting that there was no one warming in the Red Sox bullpen even with Bregman in the on-deck circle readying for his 3rd PA.
Bottom: After Jose Altuve and Carlos Correa struck out, Yuli Gurriel ended a nine-pitch at-bat with a line drive off the left-field wall. Andrew Benintendi bobbled the ball, allowing Gurriel to easily make it to second. Marwin Gonzalez struck out to end the inning. 3 changeups, an elevated fastball to change the eye level, and a change in the dirt for a K. Price gave him nothing to hit with a runner in scoring position and still punched him out. He's through 4 innings in 73 pitches. Top: Justin Verlander retired the side in order, including back-to-back strikeouts of Rafael Devers and Christian Vazquez. Bottom: David Price retired the side in order. His pitch count: 47. Top: After Andrew Benintendi struck out looking, J.D. Martinez launched a solo homer to left field to give the Red Sox a 1-0 lead. Martinez demolished an elevated curveball and pulled it down the LF line for his HR since Game 1 of the ALDS. Minute Maid got so quiet during the flight of the ball that it echoed throughout the park when it hit off a metal sign above the Crawford boxes. Price isn't working up in the zone as much as he typically likes to righties, especially with the cutter, though of course the Astros are unusually good at handling elevated pitches. Price is feeling the changeup - he's thrown more of them (12) than any other pitch. Astros have swung at 6: 4 foul balls and 2 swings/misses. Price has already established a willingness to throw all four pitches (2- and 4-seam, change, cutter) in two-strike counts. 2 of his first 3 cutters have been for called strikes - probably the best barometer of the effectiveness of the pitch. Jeff Kent, who played two of his 17 seasons in the majors for the Astros, is throwing out the first pitch. Sox updates: Chris Sale threw from flat ground and is ready to start Game 6 if needed. ... Pearce is fine. Moreland is just ready to play after the hamstring strain ... ?I haven?t gotten it yet,? 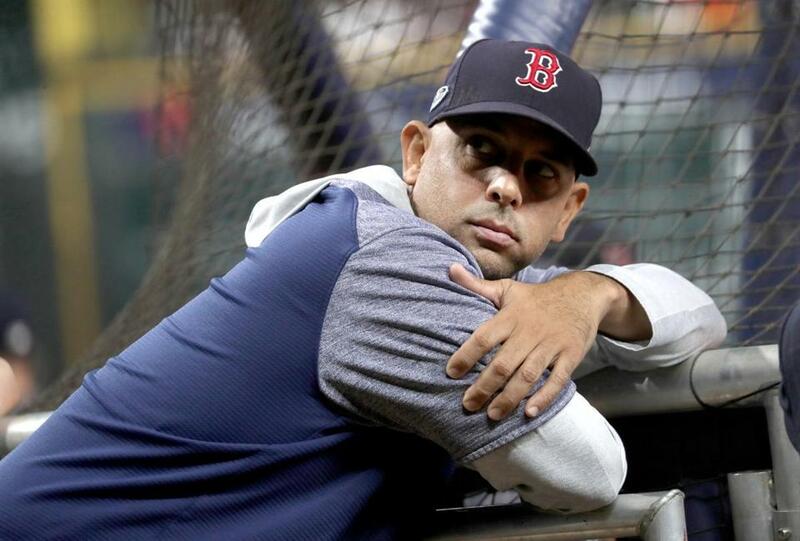 newly 43 Alex Cora said when asked what was the best birthday gift he received. Red Sox players Xander Bogaerts (on ground) and J.D. Martinez had their own methods of stretching prior to Game 5. If the Red Sox win tonight, they are on to the World Series, which would start on Tuesday at Fenway Park. If the Sox lose, the ALCS is headed back to Fenway, where Game 6 would be Saturday. A Game 6 start time depends on the outcome of Friday’s NLCS Game 6. If the Brewers push the series to a Game 7, then a would-be Game 6 of Sox-Astros would be at 5:09 p.m. Saturday; if the Dodgers oust the Brewers in six, then Game 6 of the ALCS would be at 8:09 p.m. Saturday. ■ LHP David Price (0-1, 9.95 ERA this postseason) and RHP Justin Verlander (2-0, 3.18 ERA) are the starters. ■ Price, still searching for his first career postseason win, makes his third start of these playoffs. In Game 2 of this series, he went 4⅔ innings, gave up four runs on five hits, struck out four, and walked four. Nick Cafardo wrote about what the Sox might get out of Price tonight and that he has a chance to win over the Red Sox fan base. ■ Verlander, making his third start of these playoffs, earned the Game 1 win over the Sox, going six innings, giving up two runs on two hits, striking out six, and walking four. * 4-0 on the road in the postseason and gave scored 36 runs. * Bullpen has a 3.67 ERA in the postseason. * 11 games, Sox vs. Astros this season. Sox have 56 runs, Astros 54. ■ Chad Finn: Where to rank Andrew Benintendi’s catch, and other questions from the Red Sox’ Game 4 win. ■ Couldn’t stay awake for all of last night’s win? Here are six can’t-miss Red Sox plays. ■ How Mookie Betts and Andrew Benintendi pulled off those remarkable plays last night. ■ Everything you need to know about the fan interference call that went the Red Sox’ way. ■ How will the Red Sox handle a still-ailing Chris Sale?